The hotel as seen from closer to Kloogaranna. Paldiski (Pakri peninsula) over the bay. SPA is in that house. It is nice to swim in such a place facing the forest that is behind me. 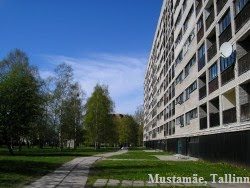 This is further away along Kloogaranna tee, a manor (mõis) called Kõltsu. This was close to Treppoja shop at Joa tee (Jet way). Houses at Raudkotka tee (Iron-eagle way) in Kloogaranna. At first, I thought this is some wooden factory but maybe it is not.